You’ve seen the Arctic once, that vast, white nothingness, so you’ve seen it all, right? Not quite. After spending 6 months in the Arctic, transitioning from Greenland to Alaska half way through, I realized how different various parts of the Arctic could be from one another. 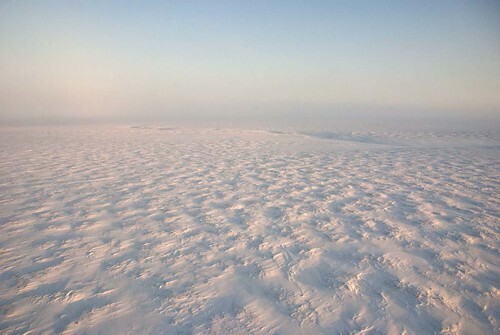 A view of the tundra just outside of Barrow, Alaska from a helicopter. In Greenland this summer, IGERT Fellow Julia Bradley-Cook and I trekked and camped in the stunning mountainous region of tundra bordering the Greenland ice sheet near Kangerlussuaq (67° 01’ N, 50° 42’ W), collecting samples for her research on soil carbon dynamics in the area. Kangerlussuaq is more of an outpost than a town; mainly existing to support the international airport located there, the scientific community, and a growing tourist economy. 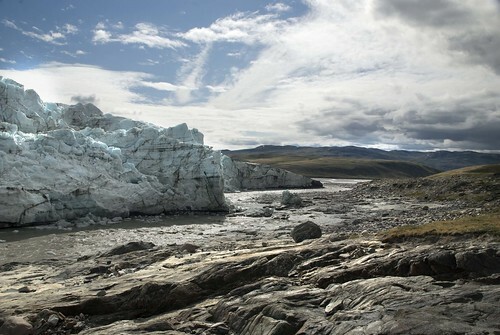 One of our many stunning lunch spots, at Russell Glacier near Kangerlussuaq, Greenland. Barrow, Alaska (71° 18’ N, 156° 44’ W), on the other hand, is a booming city compared to Kangerlussuaq. 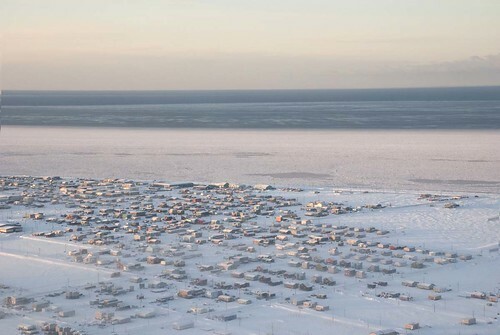 The city is the seat of the North Slope Borough’s government and has a population of around 5,000 people, approximately 60% of whom are Alaskan Native Iñupiaq Eskimo. 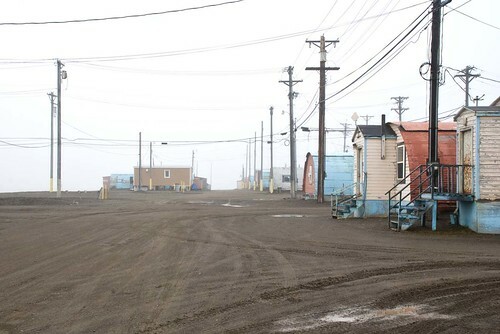 When I arrived in Barrow I was stunned to see a completely flat horizon line in all directions, the Ocean to the North, and the openness of the “slope” to the South. The community also seemed improbable: hundreds of houses built on stilts, plopped down on a dirt patch. There are no paved roads in Barrow (due to permafrost), but there are a number of stoplights and no shortage of cars, ATVs and snowmobiles. During my three-month stay in Barrow I worked as a community outreach intern for the Barrow Arctic Science Consortium (BASC) through the Dartmouth Stefansson Fellowship program. Up until very recently BASC provided logistical support for researchers visiting Barrow and functioned as a bridge between the scientific community and the local community through weekly outreach events. I came onboard to start up a new outreach effort targeting local k-12 students. 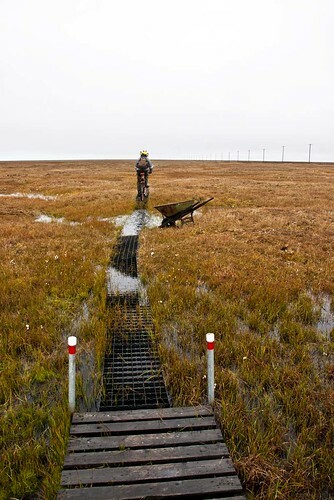 A researcher heading out into the large patch of tundra that makes up the Barrow Environmental Observatory. What really surprised me in my work with students was the lack of awareness for the wealth of research taking place in Barrow (since Barrow is one of the major hotspots for Arctic research). 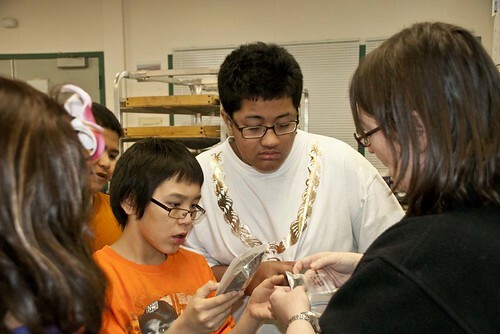 With the support of the school district, I was able to connect students to visiting scientists and local science organizations via small group field trips and class visits. In the three months we organized and ran 33 field trips and set up a framework to continue the program throughout the school year and into the summer. It is my hope that this internship will continue either with BASC or with another local logistics organization so that teachers and students can take advantage of all the special opportunities and resources in their community. Middle School Students on a field trip with local Archaeologist Anne Jensen. While my experiences in Greenland and Alaska felt like polar opposites, together they gave me a bigger and better picture of Arctic life! 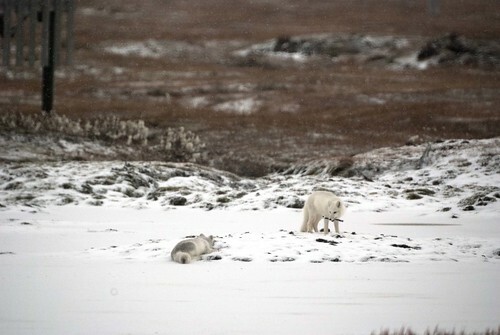 A couple Arctic Foxes enjoying the first snow of the season in Barrow.